Enjoy the pleasure of 2,800 sq ft of modern spacious living without the big oil or gas bills! 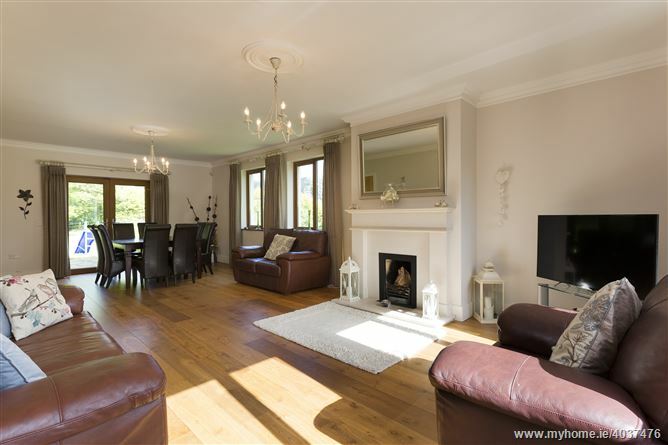 Stunning 4/5 bedroom geo-thermally heated detached family home at the edge of Glenealy village with beautiful views of Carrick mountain and an easy commute from Dublin City Centre. 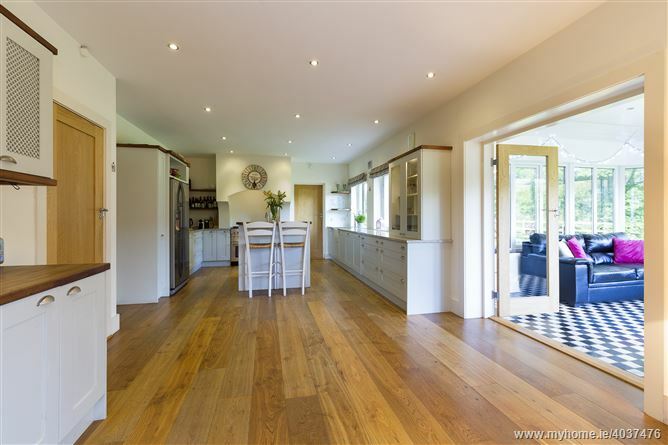 This stylish family home has 2,800 sq ft of living space with solid American Oak flooring throughout the ground floor, bespoke kitchen, 3 reception rooms and built-in home study. Upstairs there are 4 double bedrooms (2 ensuite) with the master bedroom featuring a large separate dressing room/baby nursery which makes up the 5th bedroom. 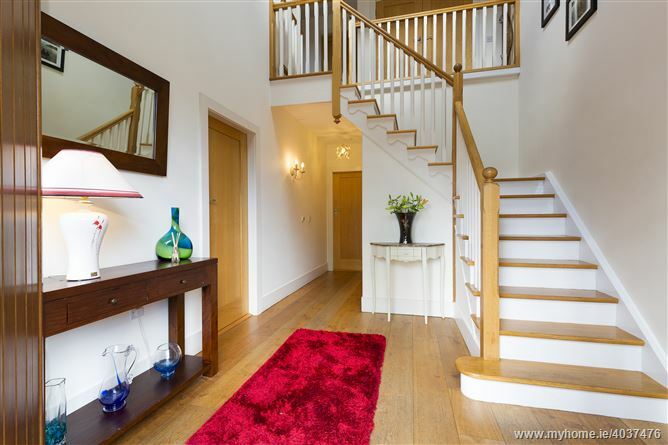 This beautiful family home is one of only 6 in an enclave of 5 similar properties, a few minutes' walk to Glenealy village with two churches, shop, post office, equestrian centre, garden centre and national school. Only 5 mins drive to the N11 and to Wicklow town with Tesco and Lidl close by. 30 minute’s drive to Cherrywood LUAS and 15 minutes to the DART in Greystones means that you avail of all of the pleasures of peaceful living but right on the doorstep of all amenities. Accommodation comprises of entrance hallway, sitting/dining room, kitchen/breakfast room, conservatory, living room, study, utility room, 4 double bedrooms (2 ensuite), WC. 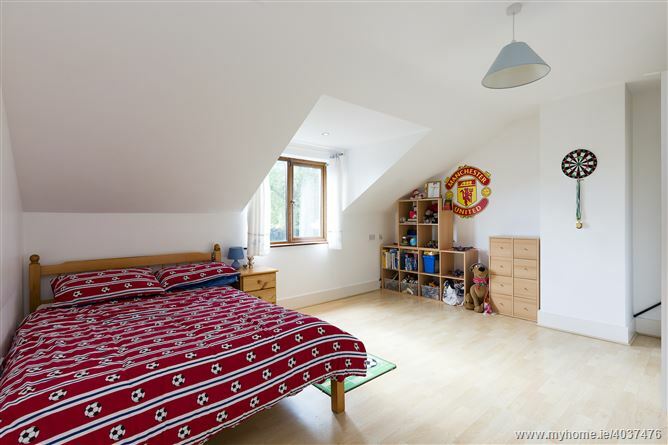 The master bedroom features a large dressing room most recently used as an additional bedroom/baby nursery. Outside, electric gates lead to driveway accommodating multiple cars, a patio area, and ¾ acre of landscaped gardens, a heaven for children and keen gardeners. Viewing of this fabulous home is highly recommended. 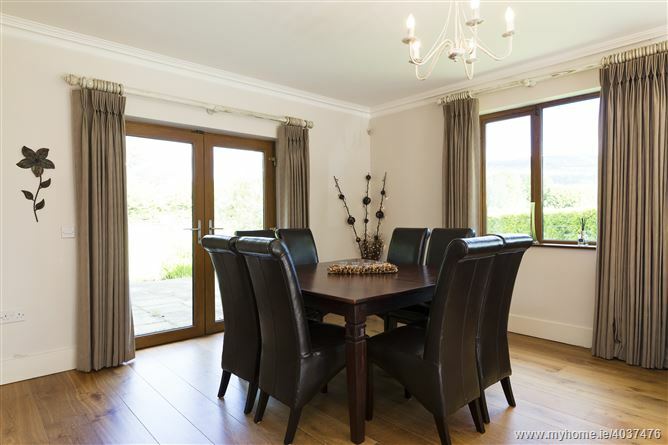 Living/dining room - 9.1m x 4.7m with limestone surround open fire and double doors to rear patio. Kitchen/breakfast room - 8m x 3.8m with solid wood hand-painted bespoke kitchen. Door to utility room - 3.1m x 2.5m plumbed for washing machine, door to side garden. Conservatory - 4.7m x 3.9m with tiled floor and double doors to patio. Sitting room/TV room - 4.6m x 4.4m with solid fuel stove. Study - 3.9m x 3.5m with custom built shelving and desks. 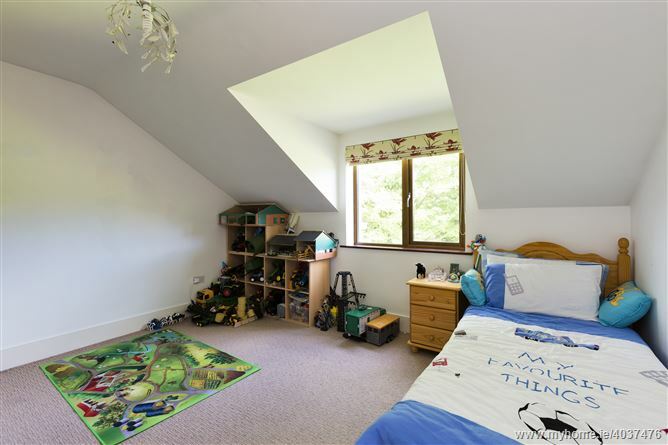 The master bedroom 5.6m x 4.6m features a large dressing room (3.6m x 3m) most recently used as an additional bedroom/baby nursery. 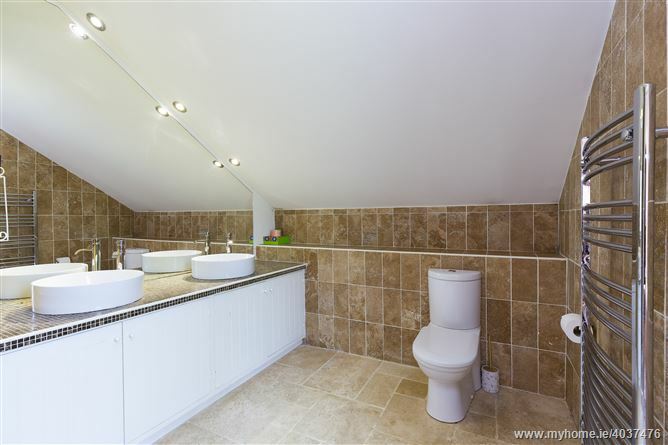 Large and luxurious en-suite 3.5m x 2.8m with tiled shower enclosure, w.c and w.h.b. 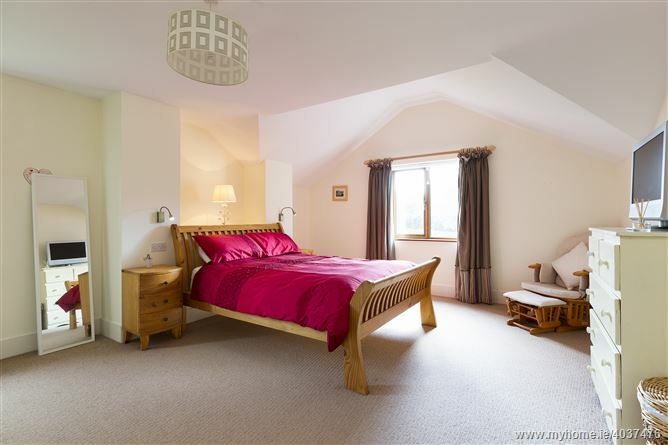 Guest bedroom - 4.8m x 3.1m with under eaves storage on both sides. Bedroom 3 - 3.5m x 2.8m with door to bathroom. Traveling south on the N11 take exit 14 to Wicklow/Rathnew. At the roundabout, take the second exit and keep right at the fork towards Glenealy. Number 6 is located on the main road behind wooden gates.